Published: July 15, 2015 at 11:22 a.m. Updated: June 23, 2016 at 07:50 p.m. The 1998 Vikings were almost perfect. The team went 15-1, setting the NFL's single-season scoring record. The Vikes won their first nine games at the Metrodome by an average of 23 points. Their life was Madden in "Rookie" mode. Gary Anderson was better than almost perfect that year. He didn't miss a kick of any kind during the regular season -- 35-of-35 on field goals and 59-of-59 on extra points. But everything changed when Anderson lined up for a 38-yard attempt that would have put the NFC Championship Game against the Falcons out of reach. Speaking of John Madden, he might have provided a jinx for the ages moments before the snap: "That's a pretty good bet, if you say, 'Do you think Gary Anderson will make this field goal?' The answer should probably be yes." The snap was good, the placement ideal. Anderson's kick started left and stayed left, gliding inches past the upright. Thanks, Madden. "It was like somebody punched me in my stomach," defensive tackle John Randle said on America's Game: Missing Rings. "Oh, my goodness ... oh, my God." The Vikings never seemed to recover, surrendering their seven-point lead and eventually losing in overtime to the "Dirty Bird" Falcons, exactly the type of feel-good team that exists solely to get crushed by a superior foe in the playoffs. Or so we thought. Said Dennis Green: "I think if we would have beaten Atlanta and if we would have gone on and beaten the Denver Broncos that we would have been called the greatest team in the National Football League the last 25 years." Anderson stuck around in Minnesota for a few more years and finished his career as the highest point scorer in NFL history. But that's not how the Vikings' fan base -- or the football world -- remembers him. Let's face it: Probably doesn't get worse than the '98 Vikings. Cris Carter almost retired because of that damn game. But what happened in the 2009 NFC Championship Game counts as a respectable second. Brett Favre was looking for revenge against the Packers, who chose to move forward with Aaron Rodgers rather than continue waiting for plumes of smoke to rise from Ol' Gunslinger Retirement Tower. The Vikings were happy to facilitate vengeance, playing along with a faux Favre retirement that freed the quarterback from his one-year engagement with the Jets. That job done, Favre went on to have one of the greatest seasons by a quarterback in Vikings history. The Vikings went 12-4 and advanced to meet the Saints in the NFC title bout. Favre was a warrior, taking a brutal beating in a game that would later serve as a major point of interest in the NFL's "Bountygate" investigation. Re-watching the game is a surreal experience: It looks like the Saints are literally trying to assassinate Favre in front of 70,000 fans and 50 million more watching at home. With the score tied at 28 and the Vikings marching toward field-goal range late in the fourth quarter, a hobbled Favre scrambled to his right and threw across his body into the middle of the field. He went Full Favre at the worst possible time. The pass, predictably, was intercepted. Numerous YouTube reaction videos tell you how Vikings fans absorbed Favre's gaffe. Sample reaction: "OH MY GOD. I WILL MURDER YOU." The Saints went on to win in overtime. Fans will forever lament Favre missing two open receivers on the play, or eschewing his second option, tucking the ball and getting five or so yards to give kicker Ryan Longwell a shot to win it. Favre was a Jon Snow-like hero in that game. Sadly, he met a similar demise as a sworn brother of the Night's Watch. » Herschel Walker trade: On Oct. 12, 1989, Dallas and Minnesota agreed on a mega-trade that involved six players and 12 draft picks. The centerpiece of the deal was Walker, a dynamic running back who Vikings general manager Mike Lynn believed to be The Missing Piece in Minnesota. He wasn't. Walker never fulfilled expectations and the Cowboys used a bounty of draft picks to build a roster that would win three Super Bowls in the next decade. The Vikings got fleeced to the point that the deal has inspired at least one detailed JFK-level conspiracy theory. » Super Bowl failures: In an eight-year span, the Vikings advanced to the Super Bowl four times. They lost each game by double-digits, including a Super Bowl IV loss to the Chiefs in which they were one of the biggest favorites in the title game's history. » 2000 NFC Championship Game: The Vikings entered their conference title game matchup against the Giants as slight favorites. They got waxed, 41-0. Kerry Collins threw for 381 yards and five touchdowns. Kerry Collins, people. The Giants outgained the Vikings by 404 yards, the largest gap in the history of the NFL playoffs. 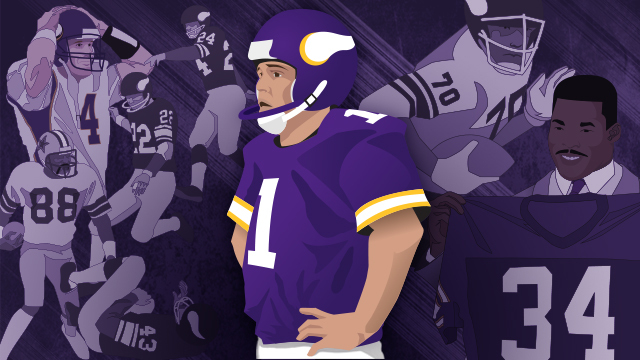 » The 'Hail Mary' Game: Led by Tarkenton and the famed Purple People Eaters defense, the Vikings went 12-2 in 1975, advancing to meet the Cowboys in the divisional playoffs. With Minnesota leading 14-10 with 37 seconds to play, Cowboys quarterback Roger Staubach unleashed a deep throw from midfield toward Drew Pearson, who was covered closely by Vikings star corner Nate Wright. As the ball neared the two players, Wright fell to the ground, Pearson made the reception and stepped into the end zone for the game-winning score. Wright claimed he was pushed to the ground and furious fans at Metropolitan Stadium rained objects onto the field, including a Jack Daniels bottle that knocked out field judge Armen Terzian. The Whiskey Bottle Curse was born. » Marshall's Wrong Way Run: On Oct. 25, 1964, defensive end Jim Marshall committed the ultimate NFL blooper. Marshall scooped up a fumble by 49ers running back Billy Kilmer and sprinted to the end zone ... the wrong end zone. After he crossed his own goal line, he flipped the ball out of bounds, resulting in a safety for San Francisco. "Twitter would have blown up if they had it then," defensive end Carl Eller told the Pioneer Press. » 2005: Any season that involves something called the "Love Boat Scandal" and a catastrophic knee injury to the star quarterback can be qualified as "very, very bad." Drew Magary is a writer for Deadspin, correspondent for GQ and author of three books, including his latest, "The Rover." He's also a lifelong Vikings fan. What was the most painful loss in your time as a Vikings fan? God, I hate you for asking this. Anyway, my personal answer is the 1998 NFC title game loss to Atlanta. If you say the name O.J. Santiago around me, I kick your dog. Have you attended games at the Metrodome? Do you have a favorite/worst memory about watching the team in person? I went to a Christmas Night game in 1989 with my brother and watched the Vikes beat the Bengals. Just him and me. I think that was the first sporting event I attended without real adult supervision. I enjoyed myself, plus walking out of the Metrodome is fun because the air flow pushes you out. 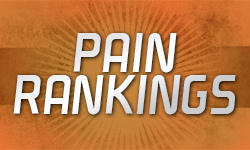 Gary Anderson is our Vikings Patron of Pain. Is there a better choice? Oh, take your choice. I don't really blame Anderson for that loss. Denny Green was much more to blame. Back in 2000, there was a dude named Wasswa Serwanga who played corner in the 41-0 title game loss to the Giants. And I'll always remember him as a symbol of the Vikings' failure. They acquire nice players and they sometimes make a decent playoff run, but there is always one HORRIFYING weakness that any team with a brain can exploit and eventually cause their downfall. That was Wasswa Serwanga. He sucked. If you were somehow able to seize total control of the Vikings enterprise, how would you run the team? Do you think you'd make a good NFL owner/GM? I'd be awful. I'd f--- everything up. Frankly, I think the team is in fairly good hands right now, so I wouldn't change much. Apart from firing Norv [Turner]. Can't have Norv around. Do you believe Teddy Bridgewater and Mike Zimmer could be the guys who finally get the Vikings over the Super Bowl hump? Shut up. Don't ask me that question. Don't jinx it. Screw you.